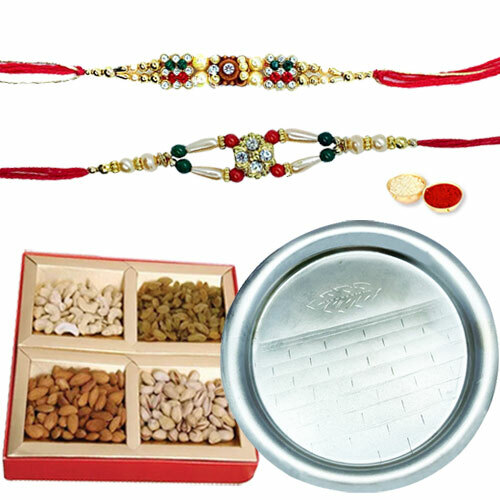 On the joyous occasion of Raksha Bandhan, make your bond stronger with your dear ones by ordering this Classy Gift of Scintillating Pooja Thali and Appetizing Dry Fruits delightfully combined with 2 free Rakhis, Roli Tilak and Chawal. The assorted Dry Fruits weighs 250 Gms and the size of the Thali range from 7 to 8 inches. The formation of the Rakhis may comes with alteration depending on the availability.